Liquids packaging manufacturer required 100 GPM @ 20 FT TH of NaOCl-based proprietary domestic bleaching cleanser (Liquid Comet), Ambient temperature, 1.14SG. Material of Construction: Certified commercially pure Titanium (ASTM GR. 2). Single Internal Mechanical Seal (1-1/8"): Hastelloy C-276 metal bellows, Silicon Carbide mating faces, Viton o-rings. Motor 2 HP, 1750 RPM, TEFC, chemical duty 1.15SF, 145TC W/FT. Included: Fabricated Stainless Steel channel support base. Apple Flume Systems required Velocity Pusher to Impart Velocity to the surface of the water in order to move apples. 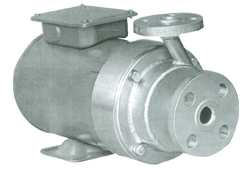 An additional requirement was that the pump retrofit, and be exactly dimensionally interchangeable at piping connections with Crane Deming Series 7171 Cast Iron Pumps. Vibration-free operation at Zero head. Performance: 700-800 GPM at 0-2 FT TH with 3" solids handling capabilities. Seal: Standard Crane Type 21V (XF10 10 1). Motor: 5 HP, 1750 RPM, 184 JM Frame, NOL. Impeller: 6-1/2" diameter, 2 bladed. 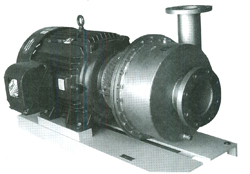 Textile dyeing machinery manufacturer required recirculating hot water (with interrupted suction) at 205°F with lint and string and low Static Head: 200-500 GPM @ 44-16 FT TH. Close-coupled, double sealed, Vortex impeller. 7" diameter Vortex (recessed) impeller. Double seal: (Inboard: silicone carbide mating faces, viton elastomers and 316 S/S metal parts: Outboard: carbon vs. high purity ceramic mating faces). Motor: 10 HP, 1750 RPM, TEFC, 215TC frame w/feet. By-Pass (Product) flush to mechanical seal area. Download this problem solver as an Adobe PDF file. 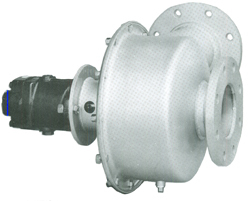 Impeller: enclosed, two bladed, 3" vane width, 7.0" diameter. Snack foods manufacturer required compact, quiet pumps for process water, 140° F, 25 GPM @ 92 FT TH (40 PSI) with complete wash-down capability. 2 1/2" Double Mechanical Seal assembly: Carbon vs. Silicon Carbide (both ends). 50 HP, 1750 RPM, TEFC motor. OEM of textile dye-making machinery had problem in circulating hot (200°F) dye waste containing lint, string and "rope-like" yarn. 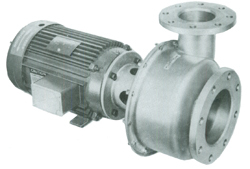 4 x 3 (suction x discharge) flat-faced flanged horizontal pump. Pump was CLOSED-COUPLED to a 10 HP, 1150 RPM, six pole, 575 volt, 256 frame TEFC motor. Single Internal Mechanical Seal: 3.000" diameter, type SAI (Carbon vs. silicon carbide mating faces, Alfas O-rings and stainless steel metal parts) by A.E.S. Engineering Ltd.
Seal isolation chamber behind impeller with hard piping to suction for axial thrust balance. 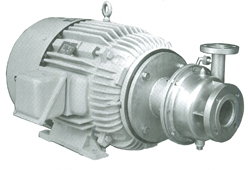 Motor: 75 HP, 3500 RPM, TEFC, 365 TSC with feet. Material of construction: (Certified) Monel 400 (shaft extension: K Monel). 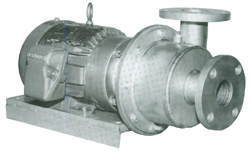 14 - 3/8" diameter impeller (Monel 400): enclosed, slip-on design. Mechanical seal: RAM 4-1/2", Type 37, single spring nonpusher design: Silicon Carbide vs Silicon Carbide mating faces, Viton O-rings and Monel 400 metal parts. Motor: Baldor severe duty, premium efficient: 100HP, 1780 RPM, TEFC, 405TC with feet. Fabricated reinforced channel Steel base (20"x54") with motor risers (cleaned and painted per specs). Radiographic inspection of nozzle welds. Major breakfast cereal producer required 88 GPM at 120 PSI (277 FT TH) of a flavor reactor solution in a sanitary and CCIP (chemical-clean-in-place) environment at 1750 RPM. 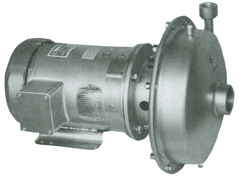 Closed-Coupled, end suction, single stage, horizontal, "semi-sanitary"
Enclosed, 3 bladed, 16 1/4" diameter; max. solids: 3/8"
Sanitary design: polished & finished interior, all welds ground flush and polished. Stainless steel adjustable ball feet base. Liquids packaging manufacturer required 100 GPM @ 20 FT TH of NaOCl-based proprietary domestic bleaching cleanser, (Liquid Comet), Ambient temperature, 1.14SG. Single Internal Mechanical Seal (1 - 1/8"): Hastelloy C-276 metal bellows, Silicon Carbide mating faces, Viton o-rings. Motor: 2 HP, 1750 RPM, TEFC, chemical duty 1.15SF, 145TC W/FT. Manufacturer of industrial waste water treatment systems required compact pump for 140 GPM @ 50 FT TH of water with 1% HF and 1% HCl. Pump required to transfer Monsanto's heat transfer fluid, Therminol 2472, at 40°F at rate of 3 GPM @ 10 FT TH. 300# raised face flanges on suction and discharge. Crane 1 1/8" type 9 mechanical seal with carbon vs. tungsten carbide mating surfaces, glass filled teflon wedge and clamped-in seat. 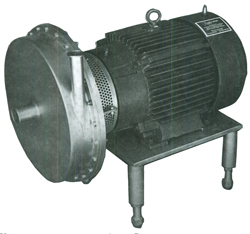 Motor: Reliance SXT with fungus protection (Tropicalized insulation): 1/3 HP, 1800 RPM.